Devil May Cry V is another entry in the popular series of slasher games developed by Capcom. 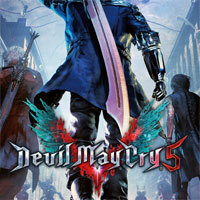 The previous game in the series, DMC: Devil May Cry from 2013, was developed by Ninja Theory. The fifth entry was created by the authors of previous entries in the series, including Hideaki Itsuno, a developer of the role-playing game Dragon’s Dogma. The game is a direct sequel to the fourth entry in the series. Devil May Cry V is a more serious game than its predecessors and it presents Dante in a slightly different way. Devil May Cry V for PC and PS4 is based on the same principles as its predecessors. It is a slasher game with advanced combat system. The game is split into levels, completing which is awarded with grades. The developers introduced some novelties, including sandbox features. While designing the world, the developers took inspirations from Dragon’s Dogma. Although the game isn’t a typical sandbox, the maps feature much more freedom than previously. Due to that, movement of the protagonist off combat has been improved and shifted more towards to the mechanics known from Bayonetta (however, the protagonist isn’t limited by a stamina bar). Although the game doesn’t lack spectacular scenes, they aren’t based on QTE sequences. The combat was improved as well, although it lacks any revolutionary changes. The surroundings feature interactive objects that can be used in battle. In addition to that, players participate from time to time in large battles like in musou games, where one must face many enemies simultaneously. The most spectacular, challenging and advanced battles are the ones against bosses – a single duel can be split into a few sequences that take place in separate sceneries. Unreal Engine, a technology used in games like Gears of War 4, Playerunknown’s Battlegrounds and Street Fighter V, was used for the development of Devil May Cry V for PC and PS4. The title works in 60 frames per second and it features dynamic camera system that for example moves away from the character during combat with large groups of enemies. It is worth mentioning that the cutscenes in the game were directed by Yuji Shimomura who also worked on the third and fourth game in the series. Onyay Pheori (who also worked on Devil May Cry 4) helped in composing the soundtrack to the game. Rueben Langdom once again dubbed Dante while Johnny Young Bosch played Nero and Dan Southworth acted as Vergil.